Good morning! 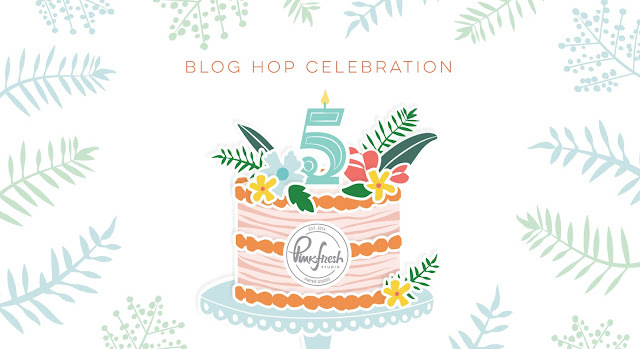 Excited today to be celebrating a very big milestone for Pinkfresh Studio - it's their 5th Birthday, and there is a blog hop and celebration today to celebrate! You aren't going to want to miss a stop along the way - TONS of inspiration and prizes up for grabs! YAY! 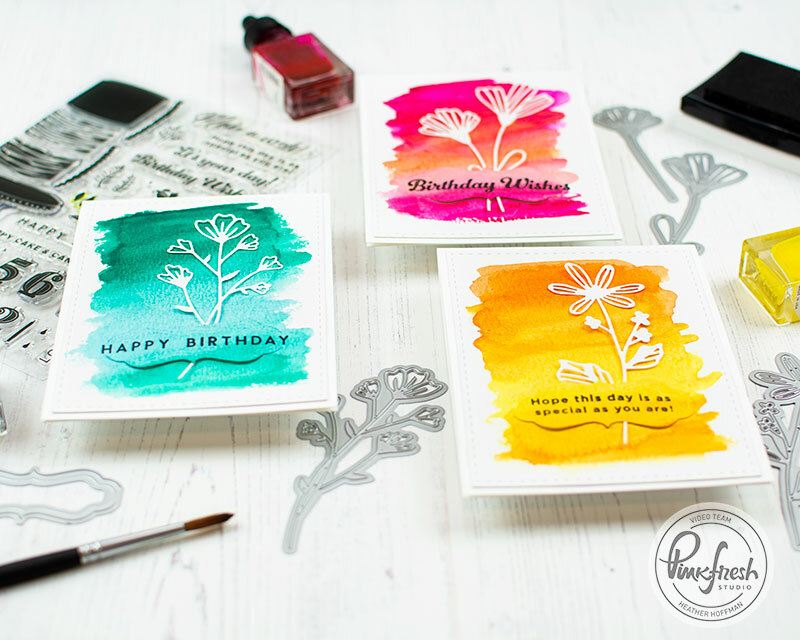 Since it's a birthday party, I decided to create some birthday cards with some of my favorite Pinkfresh Studio products - and when you are making one card, it is just as easy to make 3 and have more on hand, don't you think? I started off by created watercolor backgrounds on panels of watercolor paper using Pinkfresh Studio's Liquid Watercolors in Bubblegum, Clementine, Sunshine, Aquamarine, and Emerald City. While those dried, I die cut several of the Dainty Blossoms Dies from white cardstock. Once the watercolors dried, I die cut frames using Noteworthy Frames die set to tuck those intricate Dainty Blossoms into. I taped them from behind, and also added touches of liquid adhesive behind the flowers to hold them in place. I stamped my sentiments from Make a Wish stamp set on the frames, using my MISTI to ensure perfect placement in this late stage in the cardmaking. You may notice a sneak peek of one of the new dies that will be releasing Monday as well! I finished off by mounting on white cardbases, using foam adhesive behind the Noteworthy Frames to pop them up, then sturdy adhesive behind the rest to hold it in place. It wouldn't be a celebration without a prize, right? 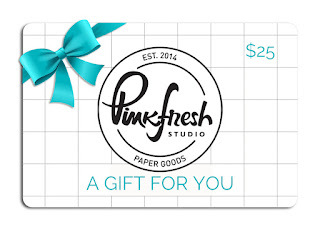 Pinkfresh is giving away several grand prizes on their blog, and then there are $25 gift cards to Pinkfresh Studio up for grabs on each stop along the hop as well! Make sure and leave a comment here before you leave for a chance to win - and don't miss any stops along the way! Winner will be chosen and posted on the Pinkfresh Blog on Sunday, April 14, 2019 - so make sure and check back to see if you were a winner! Winners must check that page and claim their prize within 2 weeks. There are also some special deals to help celebrate! You can use the code FREESHIP5THBDAY between April 5-7, 2019 to receive free US shipping and $5.50 off of international shipping. 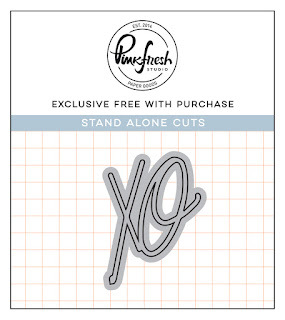 Additionally, this cute die will be added free to your cart with all purchases while supplies last! Love those cards - simple and elegant! oooooo! Such a cool technique! Love those BRIGHT BACKGROUNDS! I love your cards! I love the bright background. I loved that you used white cardstock for the flowers! Simple watercolor backgrounds give the cards a lovely look! 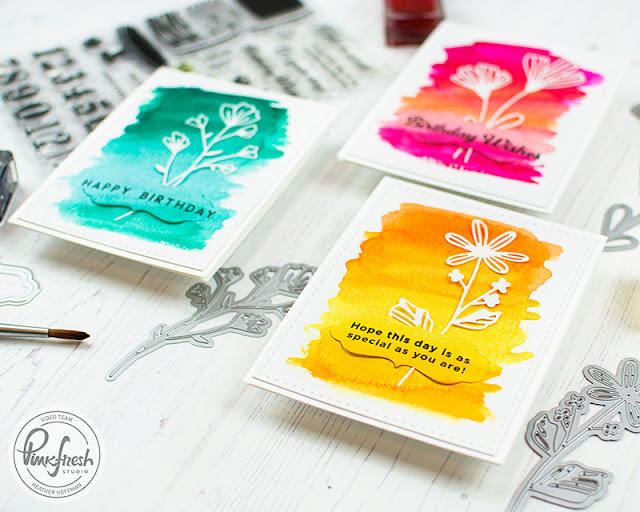 A trio of beautiful cards..... love, love the vibrant/watercolored backgrounds! So bright & beautiful! I love them!! Those watercolor backgrounds are the best! So bold and bright. Makes me smile!! I love this die set! I’ve made birthday cards with it also but love your idea! Beautiful and bright card! Love these watercolors and the way you used the die. So pretty and fun! Love your gorgeous cards!! The single white floral die cut on the vibrant backgrounds gives a beautiful effect. I haven't tried the Liquid Watercolors yet, but they look awesome! Love your use of the watercolors! What wonderfully vibrant watercolour backgrounds! Beautiful cards. Love the vibrant colors for you backgrounds! love your cards, great inspiration. Very simple cards that pack a punch with those bright colours! Love them! Ooh, I love how vibrant the colors are! Love how clean and simple these cards are! Just lovely! Love your cards. 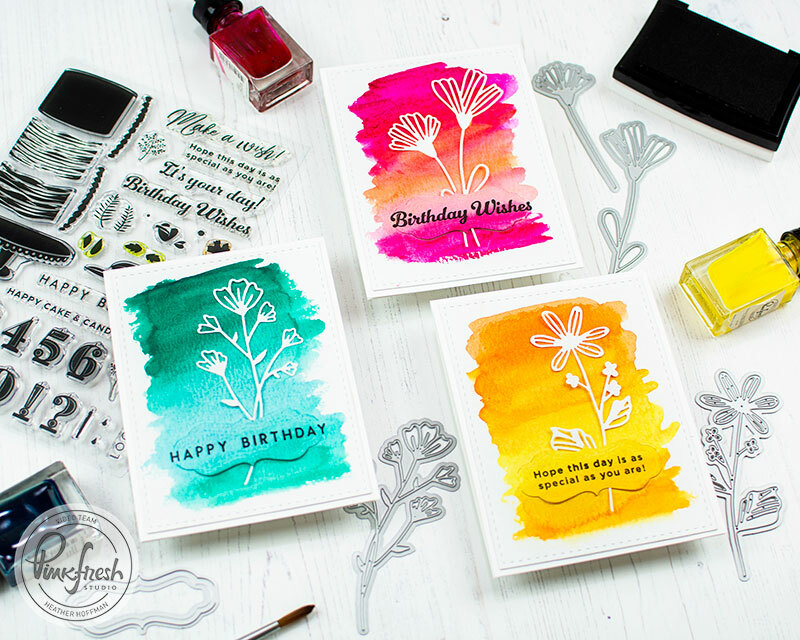 Those liquid watercolors are so yummy and bright they make your cards so happy. These are so lovely. They'd make a great notecard set to give as a gift set. Like the watercolor backgrounds and simple flowers you used. Gorgeous! I love how the colors make the white flower pop! Love how vibrant these cards are. Gorgeous! These would make a beautiful gift set! Wow! Awesome watercoloring. The colors are so vibrant. Love your cards and the vibrant colors! 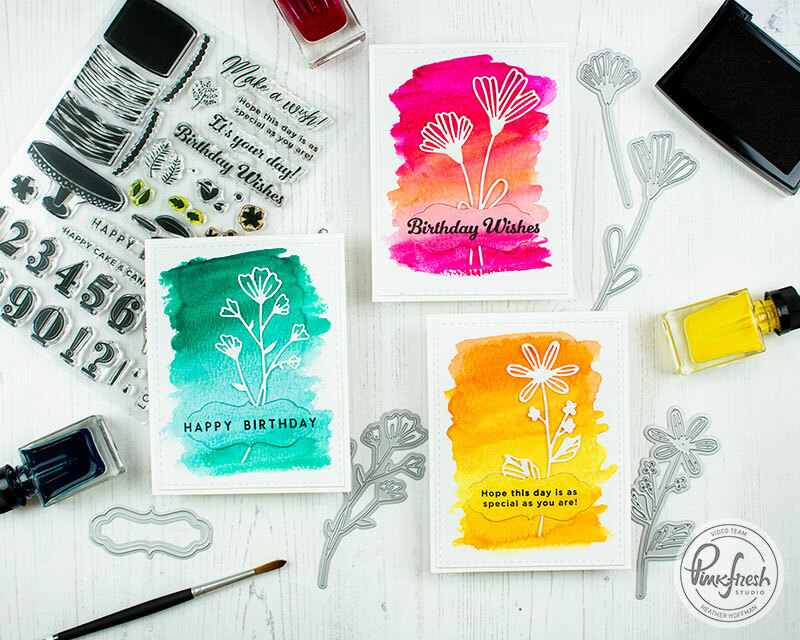 Heather, beautiful cards with the watercolor backgrounds to really show off those dainty blossoms. beautiful watercoloring, so bright and cheerful! These little frame dies are my favorite from Pinkfresh and I'm so happy you showcased them here! Your cards are lovely, those colors are so vibrant and beautiful! TFS!! Simple yet lovely cards. Like how the flower die cuts pop against the vibrant watercolored backgrounds. Love your cards and the bright happy colors! Simple and striking! Love the color! Beautiful set of cards! I love the pretty dies you used and the background colors! I love how the flower dies pop up against the bright BG! Thanks for the great inspiration! Love your set of cards. Those Liquid Watercolor colors are amazing! Happy 5th Birthday celebrations to Pinkfresh Studio. 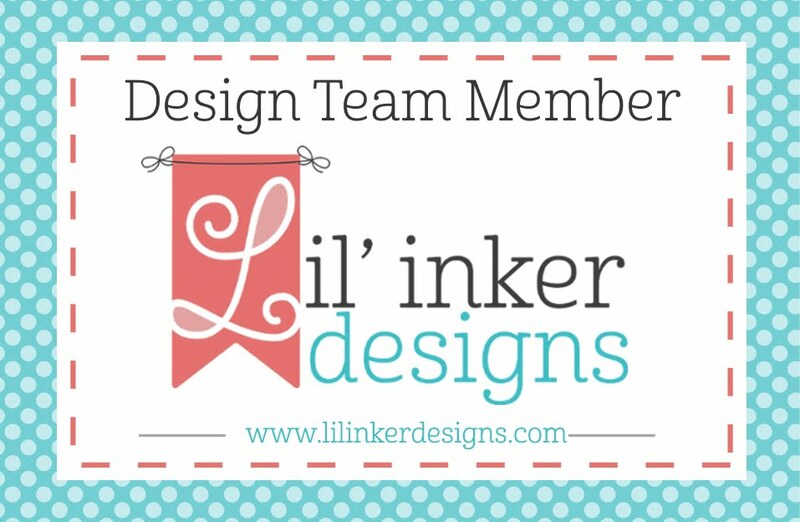 These are my favorite Pinkfresh dies, and I love your watercolor backgrounds! Such beautiful cards. I love the vibrant colors. I have had the liquid watercolors for a while but have been unsure how to use them, I will have to try creating these beautiful backgrounds. These flowers dies are very pretty. This trio of cards would make such a cute gift for the non-card maker. Happy Birthday Pinkfresh! beautiful watercolor backgrounds! Love them all! Love that these would be super easy to create or ma s produce. Nice work! Oh so cute! Like that flower die. Thanks for sharing your talent. LOVE your cards! So pretty, spring-y and yummy! Beautiful cards! You do such lovely work. Very nice set of cards with the watercolor background. Thanks for sharing. I have been spying these lovely dies. They are gorgeous with the vibrant watercolor backdrops. Bright lovely card for spring! Great job! Pretty design. Love the vibrant colors. Love the colors and those dies! Beautiful cards! I love my dainty blossoms dies but now I see I need some Pinkfresh watercolors! OMG those liquid watercolors are ahhhmazing! These cards are stunning. I love the simplicity of the white flowers against the colourful backgrounds. Oh those colours! How have I been a creative without those watercolours - they are perfection! I love the bright colorful background paired with the white die cuts! Beautiful cards - in theory simple enough, but absolutely gorgeous! I love the bold bright colours! Beautiful cards as always Heather, I just adore your style! Oh! I'm in love with these... And a little jealous, as my attempts at this sort of background haven't been successful. I'm inspired to keep trying. Fabulous cards! 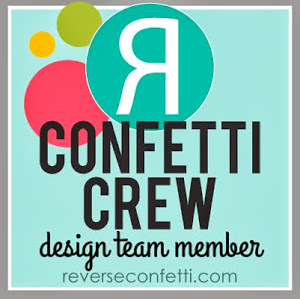 Love all the fun colorful backgrounds and your wonderful style. Very pretty set of cards. Love the watercoloref backgrounds!! 😍😍😍😍 you and pink fresh studios is a pair made in heaven!! Such lovely simple but elegant cards. Love the colorful backgrounds. The cards are simple but so pretty! Love these watercolored BG, it makes the die cut pop out. Beautiful cards. I love those vibrant PF watercolors! Those white die cuts really pop on top of them. I love those spectacular watercolor backgrounds. I love PF watercolors!! I hope one day to own a set. Love love love watecolor cards!!! These watercolors are everything! Such vibrant cards! Wonderful job. Thanks for sharing your creativity! Pretty cards, Thanks for sharing. Heather, thanks to your IG post I saw about this company and the hop. I LOVE your watercolored cards and want to try to duplicate them. Hoping I win the watercolors but I’ll settle for a GC. Great job! Lovely cards! The watercolored backgrounds are so vibrant and I like how you tucked the flowers into the noteworthy frames. Seriously gorgeous, would love to make something like this into a gift card or note card set! 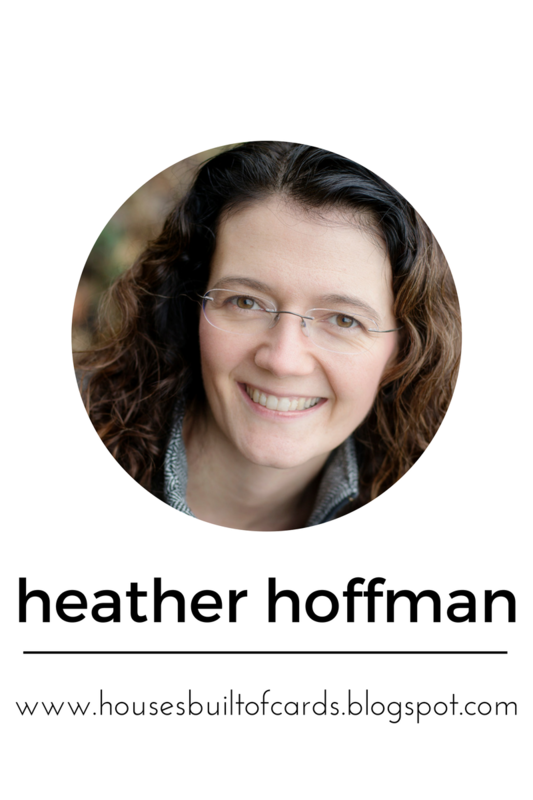 Thanks for inspiring Heather! oh my gosh, those watercolor backgrounds are so beautiful!! Tfs! Ooo, I love a white silhouette against bright watercolor backgrounds! Somehow I always forget this until I see cards like this, so thanks for reminding me of another fun technique that I need to have a go at. Love the white die cut flowers against that powerful background. So nice!! Beautiful cards. The bold backgrounds really make the delicate die-cuts pop! Congrats to Pinkfresh Studio on completing 5 years. I love your products. Wishing you many more successful years ahead. I love this group of cards! The vibrancy of the watercolors is just amazing. I think I need to check into these! Simply lovely. Like the color choices. LOVE these vivid colors, Heather!!! Oh....my eyes are so happy right now. Love the simple white die-cuts tucked behind the sentiment panel. I need to remember to try that sometime!! Oh I just love your set of cards! Lovely designs and such happy and vibrant colors. Such cheery cards! Love what a simple, clean look they have. perfect gift set! luv the happy colors! Lovely cards. I like the background and the flowers.